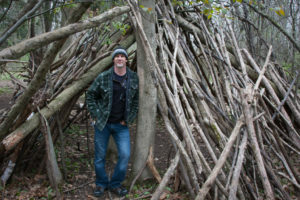 Born in Ontario, Canada, Mike Paterson has spent the last ten years delving into the mystery of Sasquatch existence with many experiences and much insight gained during those years. A childhood incident at the age of 12 forever etched in his memory was his introduction to the Forest People. His first close vocal experience in 2008 changed his life and set him on a course searching for a hidden truth. Blessed with a rare opportunity in 2012, he was invited onto a private property in the Kawartha Lakes region of Ontario to investigate and document what was believed to be Sasquatch presence at the location. He spent roughly 80 visits over the next 2 and a half years with progressive interactions, experiencing the hidden truth of the forest folk who were more than willing to interact and show their benevolent nature and incredible mind expanding abilities. Mike’s love of nature, his open mind and heart allowed a situation to progress to a level of rare interaction. His accumulated library of unprecedented Sasquatch audio recordings plus a plethora of other supporting evidence has helped substantiate answers to questions long debated within the Bigfoot Community. Mike believes through his own experiences that the Sasquatch People are revealing their existence to humanity at this time. His understanding is that their consciousness is highly developed and evolved far past our own, Sasquatch People are in complete control of their reveal and who they choose to interact with. Mike’s experiences with the enigmatic nature of the Sasquatch have allowed him to help others understand their own situations and experiences. Mike’s mission is to help bring awareness to others about the loving and benevolent nature of these ancient people who hold ancient knowledge and wisdom, an understanding of natural laws and how to live in balance with nature. Included in these replays are audio recordings of live Sasquatch communicating with Mike! Please join us for this Out of This World show! !